Sony has always been a trailblazer when it comes to new formats, but it’s been unusually late in supporting Ultra HD Blu-ray. Samsung and Panasonic both released players last year, and even smaller companies like Oppo now have players out in the wild before Sony’s debut player, the UBP-X800, has seen a release. However, for fans of Sony’s design and interfaces, the wait is almost over. The UBP-X800 will finally be released next month for a very reasonable $299 (£400 / around AU$390). Although that’s more expensive than Samsung’s debut player, the UBD-K8500, it sits cheaper than both Panasonic’s debut the DMP-UB900 and the Oppo UPD-203. Sony has a checkered past when it comes to new media formats. 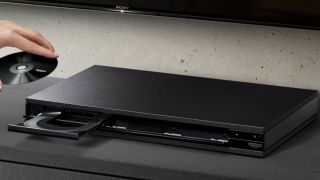 It was an early supporter of both Blu-ray player and DVD early in their life-cycles through its consoles. However it also invested heavily in Minidisk, UMD and Betamax, three formats that never caught on. Its hesitance over Ultra HD Blu-ray could perhaps be explained by a nervousness about repeating past mistakes (especially given the decline of physical media in favor of streaming). We can’t wait to get our hands on the player, which will be releasing next month. Check out our guide to the best 4K Blu-ray players around.